By Nicole LaRosa for Fordham Magazine (20 in Their 20s feature) on June 29, 2017. Whether she’s studying incarcerated people or people with disabilities—or both—Navena Chaitoo tries to shed light on the many dimensions and nuances of large systemic problems.Chaitoo works as a research analyst in the Center on Sentencing and Corrections at the Vera Institute of Justice, a national nonprofit that seeks to drive change in the justice system. Specifically, she analyzes data and works with prison jurisdictions—at their request—to reduce the use of solitary confinement. She also researches the level of confinement of prisoners with disabilities and their access to services, expanding on a theme that has run through her work since her college days. 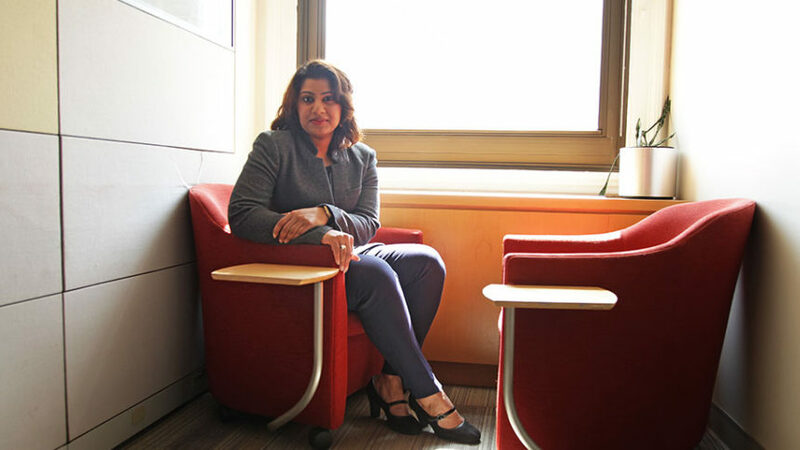 As a person with profound hearing loss, Chaitoo has had to work to get the accommodations she needs—including at Fordham, where she went a semester without stenography services in her classes.That experience led to her work on a research paper that she began at Fordham in which she examined disability and multidimensional poverty in America. “Currently, poverty is measured by what you have in your pocket—how much income you have … it’s not about your capabilities,” she said. The paper, co-authored with Sophie Mitra, Ph.D., associate professor of economics at Fordham, among others, looked at how a person’s disability might impact their ability to earn a living wage and their access to food, education, and participation in the political process. While at Fordham, Chaitoo won a highly competitive graduate fellowship award from the National Science Foundation, which fully funded her graduate studies at Carnegie Mellon University, where she earned a master’s degree in public policy and management. After graduate school, she got a job as a researcher with the Center for Alternative Sentencing and Employment Services, where she assisted with the research and development of the Manhattan Supervised Release Program—an alternative to pre-trial detention for those who can’t make bail.